A honeymoon is a special time to connect with your spouse and celebrate your new lives together as husband and wife. 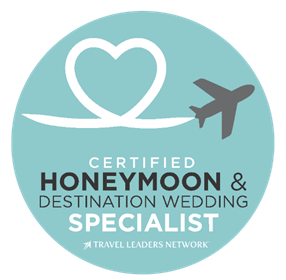 Planning your honeymoon should be fun and enjoyable! Just imagine arriving at the resort in your private car, being greeted with a refreshing drink, and then being whisked away to your beachfront suite where you can sink your toes into the most amazing soft white sand right in front of your room. Your room will have a chilled bottle of wine with chocolate covered strawberries. At night, imagine a romantic walk along the beach and returning to a drawn bath with rose petals. I would consider the destination/location of where you'd like your honeymoon to be one of the most important! Everyone has a dream of where they'd want to spend there honeymoon. Does your dream include the beach or mountains? Do you want to see historic sites or dramatic cliff side ocean views? Would you like to be able to easily get off the resort and take a stroll into town? Not all resorts are the same! Where do you want to stay? Are you in a luxury resort or hilltop hideaway in the mountains? Would you prefer a resort with a traditional feel or modern? What are your thoughts on dining and drink options? Is having butler service high on your list? Sometimes it comes down to what you really want to do. Does your ideal honeymoon involve an action packed jeep safari tour? Would you rather relax on the beach with a drink and a good book? Maybe it's a mix of both adventure and relaxation. Whatever it is, we can create the perfect honeymoon with you!